Pyinmana (writing as ပ်ဥ္းမနား in myanmar) rail-way station is quite popular.I had chances to see Pyinmana everytime our family go to Mandalay and Taunggyi. 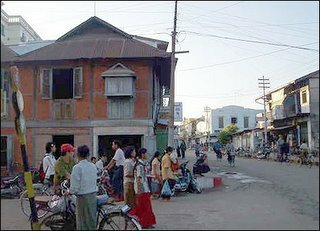 Since it will become the capital of Myanmar,I decided to collect some interesting facts about this town today. Pyinmana is sunny and hot. Most of the people used to walk on the road because the platforms are quite narrow to walk on. The highway road to Mandalay cut the platforms of the town and cut some big house to half during the development of the project. There are one thing you can bluff about if you want to show off somebody that you know something about Pyinmana. The biggest agricultural university in Myanmar, "YeZin"(ေရဆင္း) university is in Pyinmanar. How to pronounce: (P-Yin) -yin like in "dim" but pronounce with no gaps between -p and- yin like you pronounce "string" (Ma-Nar) ma-nar like you prononce "minority". 1) -In Myanmar there are 7 agricultural Institutes (SAI) and the Yezin(ေရဆင္း) Agricultural University (the most famous agricultural uni in my country it is). 3) Panlaung Pyadalin Cave Wildlife Sanctuary(Pyinmana) and how to go there. 4)Regarding to the name of the town,"Pyinmana".There is a word with the same pronounciation to "Pyin" with different spelling.The meaning is "lazy". And the meaning of the word "Ma-Na" is non-stop,restless.